Clean your wheel safely and easily! Clean your wheels safely and easily with the DI Wheel Wash Boar's Hair Brush! 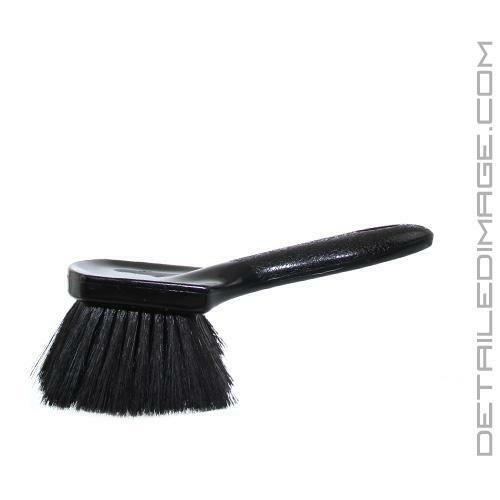 This brush is designed to gently scrub away brake dust and grime from even the most sensitive of wheel finishes. The Wheel Wash Boar's Hair Brush is constructed of an ultra-rugged polypropylene handle that features a textured surface for a non slip grip. The single tuft epoxy set construction offers 50% more boar's hair bristles than many similar products. More boars hair means greater water and cleaner absorbency, and an easier and more efficient cleaning! These bristles are resistant to most strong cleaners and provide safe, gentle agitation for virtually any surface. This means that this brush is safe to use on clear coated, anodized, polished, aluminum, painted, powder coated and chrome wheels! If you are looking for a brush to cover all of your wheel cleaning needs then pick up the DI Wheel Wash Boar's Hair Brush today!